Gallery of beautiful white living room ideas including a variety of design styles, furniture and layouts. Famed for its timeless elegance and universal appeal, a white color scheme on any interiors is a safe and sure way to create a design that will turn heads and leave a lasting impression. Others sometimes find this color boring, but the benefits of using a white color scheme for interiors outweighs the few cons of it being “too safe” and “boring”. With the right variety of white shades, patterns, textures, finishes and accessories, you can still create a fun and dynamic design even with an all-white scheme. Best of all, white looks good on any design or period styles, and is easily manipulated in case you want to add more accent colors later on. The picture above features a transitional style living room which uses classic furniture silhouettes combined with modern materials to give it a more updated feel. Walls were painted in a taupe-tinted wall color, while built-in shelves uses pure white to help accentuate the display pieces. You will also see the use of chrome finish stainless steel, marble and mirror, giving the space a sleek and modern feel, while the shaggy white rug and the variety of white pillows softens up the space. Although there are many benefits of using white, it could also be a tricky color to use. Using a single shade of flat white all over your interiors could end up looking “sterile” or hospital-like, and high maintenance. To avoid this, make sure you use ‘tints’ to add variety to your whites. You can introduce an ivory, a cool white color, and many other varieties. You should also mix in different textures and patterns in different parts of the space, to avoid a “flat” look. Fabrics – experiment on using different fabrics for your furniture and pillow. You can use suede, leather, velvet, linen, etc, or a mixture of different fabrics. 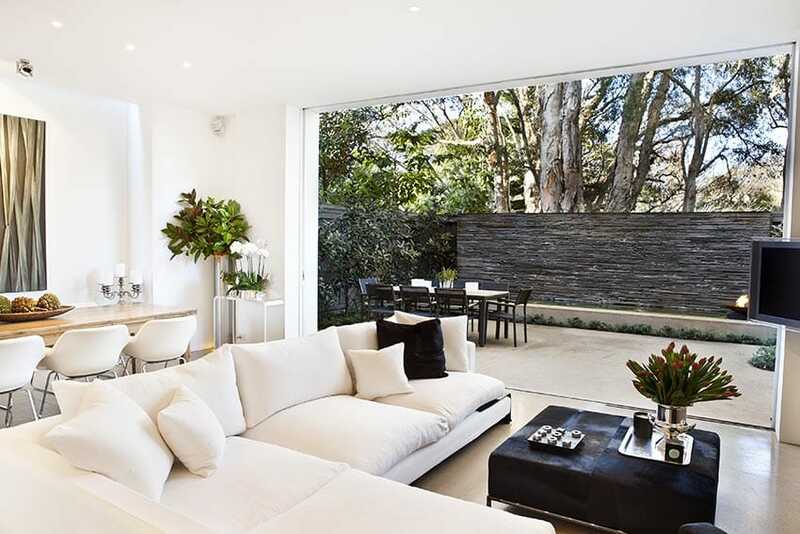 This contemporary living has a simple yet refreshing look. The use of low sectional sofa makes the ceiling appear higher, and the open floor plan of the space helps visually expand the space. While the ceiling uses a flat white color, the walls have been tinted with a very faint gray color to give a subtle contrast against the white-painted cabinetry. Accent pillows uses grays and muted blues to give the space a cool and refreshing pop of color. 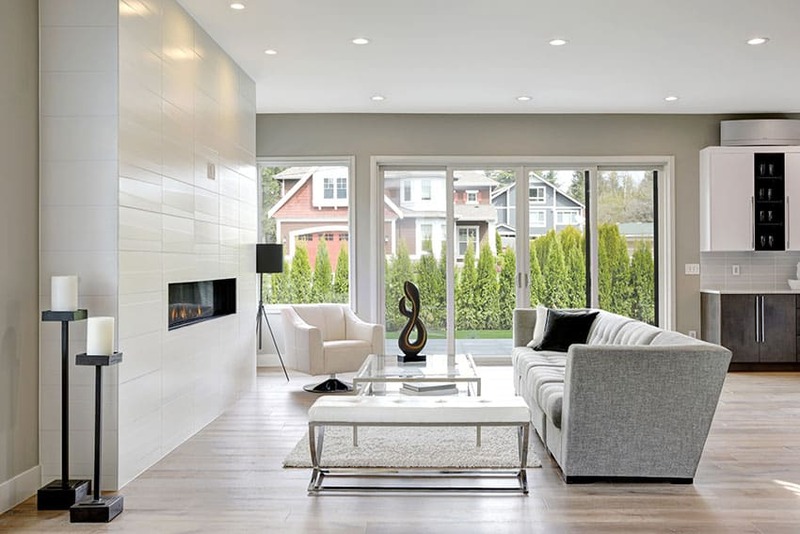 This is another great example of a white living room which is technically not “all-white” yet is able to reap the maximum benefits of white interiors. The walls were painted in a white color with a very faint tint of light blue to help contrast with the white panelings, doors and windows. Warm walnut flooring and tables helps bring more warmth to the space. For the furniture, a combination of white and light gray were used for variety. Most of the elements used in this space is white, but were mixed with other neutral colors to help add depth and variety to the design. 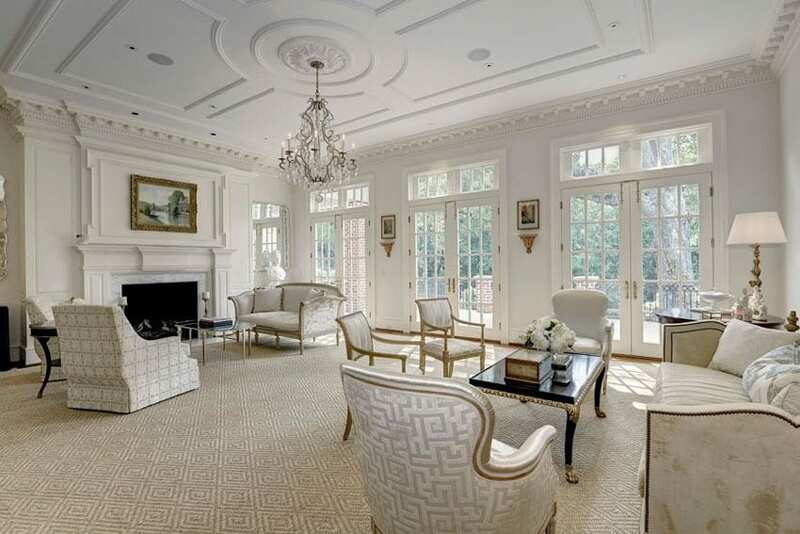 Walls were painted in a light taupe color, helping the white ceiling, doors and windows frames, stand-out better. The accent wall with a built-in electric fireplace is clad with 3D tiles, adding a modern texture and shine to the surface. The furniture pieces used were very sleek and modern, perfect for the small, limited space of the living room. 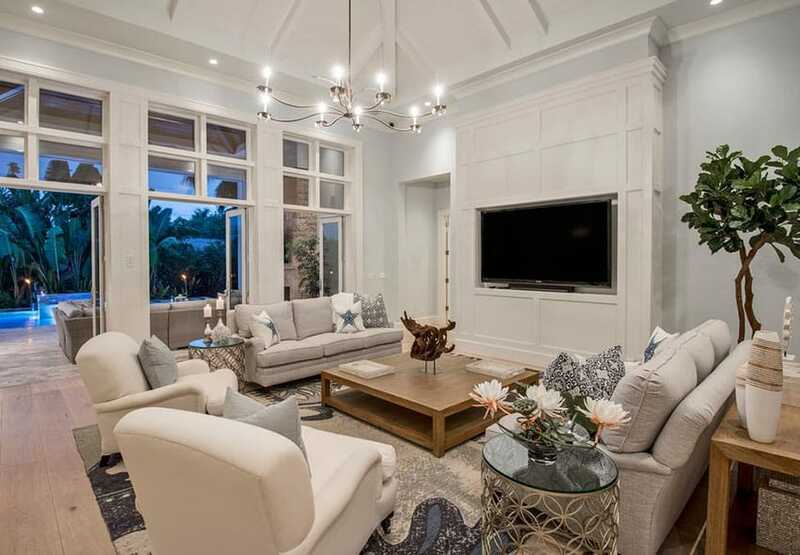 This living room is connected to the gazebo area, and has a gorgeous open floor plan. So even though it might be a bit tight on space, it still looks spacious as it also uses white paint on its walls and ceilings. Most of the color will be found from the view outdoors, with all the plants and the slate tiles. Some indoor plants were also used to accessorize the space, helping bring in nature inside, and adding a pop of green to the mostly white furniture pieces. This elegant formal living area is already spacious by itself, but is further made to look more spacious by using white paint on the walls, and using mostly white furniture pieces. It also combines different fabric textures, prints and also adds other elements to bring in variety to the space. So despite using an all-white color scheme, this classic beauty does not feel boring nor sterile, but exudes a very regal aura that will definitely put your guests in awe. The stark contrast between the solid cherry wood flooring and the white walls of this living room create bold contrast, making it easy for certain details and elements to be noticed. This small living room space consists of two modern sofas with pale light gray upholstery, framed with an abaca flat-weave rug creating a border against the dark cherry flooring. Since the space is quite small, a mirror was placed behind the display shelves, further lengthening the space visually. This gorgeous minimalist home shows an all-white color scheme that does not feel too sterile. The wall and ceiling paints have a very slight warm tint so it doesn’t look too flat, while the porcelain tile flooring has subtle gray streaks to add a bit of pattern t its surface. You will also see the use of reflective, matte and soft finishes throughout the space, helping avoid a “flat” look. The use of indoor plants also helps bring more life to this living room, adding a pop of green to the space. A lovely example of a white living room which adds just enough subtle accents and colors into the space, while still helping maintain the white finishes to stand-out. 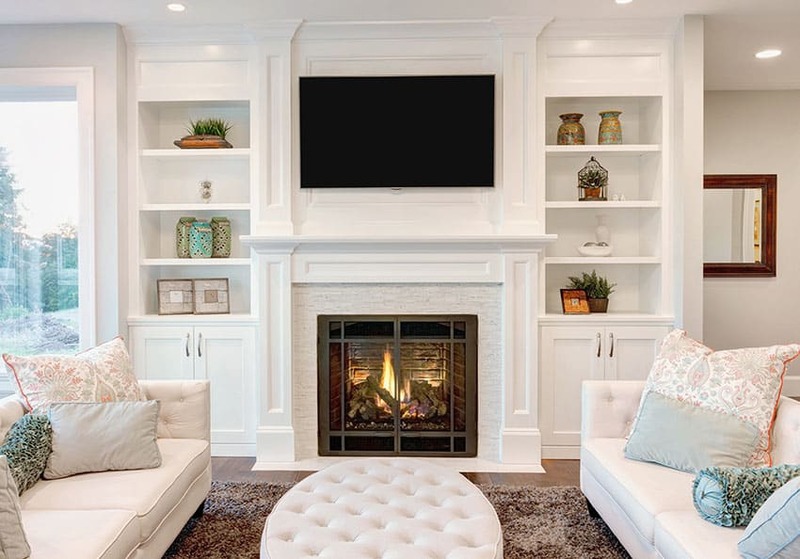 The transitional style living room has a built-in electric fireplace with a wooden mantle and display shelves flanking it on each side, all of which are painted in white. The light cream sofa and ottoman stands-out quite nicely against the mahogany flooring and the brown shaggy rug framing the living area, while the pastel-colored accessories add more vibrance to the space. Exuding a very classy and elegant appeal, this white living room combines whites with dark wengue and high-gloss finishes to achieve that modern sophisticated look. A matching set of a sofa, armchairs and a bench were uniformly upholstered in white, while its solid wood legs and matching sides table and coffee table uses a dark wengue finish. 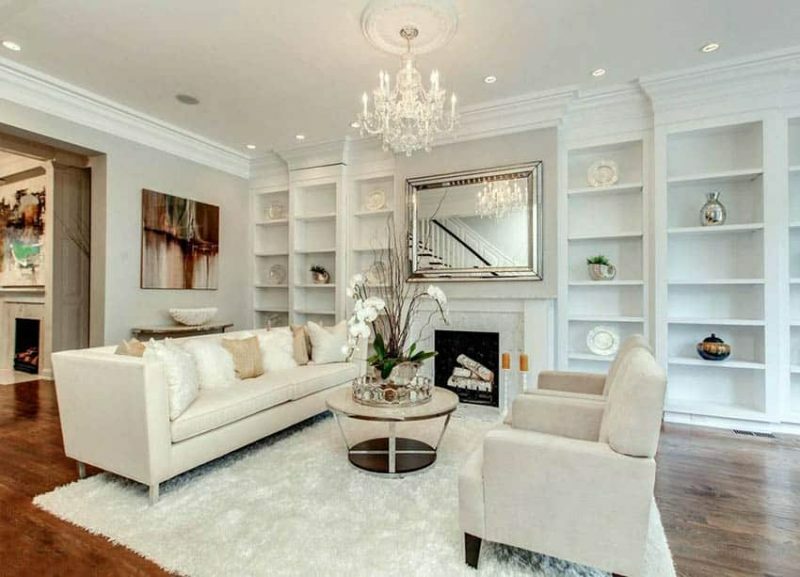 Behind the sofa is a gorgeous marble wall paneling and a full-length mirror to help expand the space. To make everything look more cohesive, mocha brown accent pillows were added along with the cream-colored pillows. Despite the modern minimalist aesthetic adapted by this living room design, it does not feel too flat or sterile, as it wonderfully combines warm shades of white with light taupes, creating a rather warm atmosphere to the space. 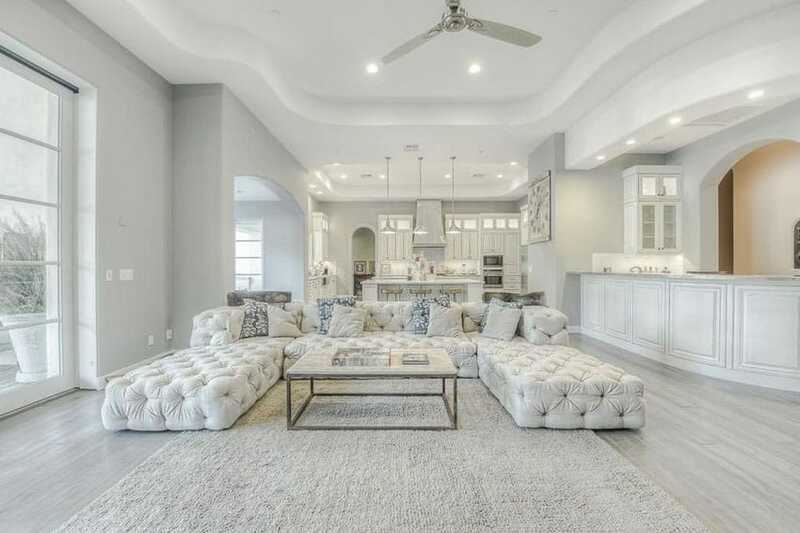 Light taupe walls serves as a great transition between the wengue floors and the white ceiling, while the light cream area rug wonderfully frames the living area from the rest of the house as it has an open layout. A light cream-colored suede fabric was used for the sofa, while the wooden elements has a wengue finish to keep consistent with the flooring, creating a more cohesive color scheme. While more subtle neutral colors such as grays and taupes are often seen as accents in white living rooms, this particular design choose a bolder dark teal color, giving the space a more youthful and fun appeal. The off-white walls are set against cherry wood floors, while the small living area is framed with a navy blue shag rug. The white sectional sofa stands-out nicely against the dark wood flooring, and is give more personality by adding in a teal throw some pillows with a litle bit of teal in the pattern. This white living room space is small yet has a very cozy and spacious feel to it, as it uses mostly white on its walls, combined with floor to ceiling-height windows. Matching rattan furniture pieces were used, adding a natural texture and a warmer tone to the space. 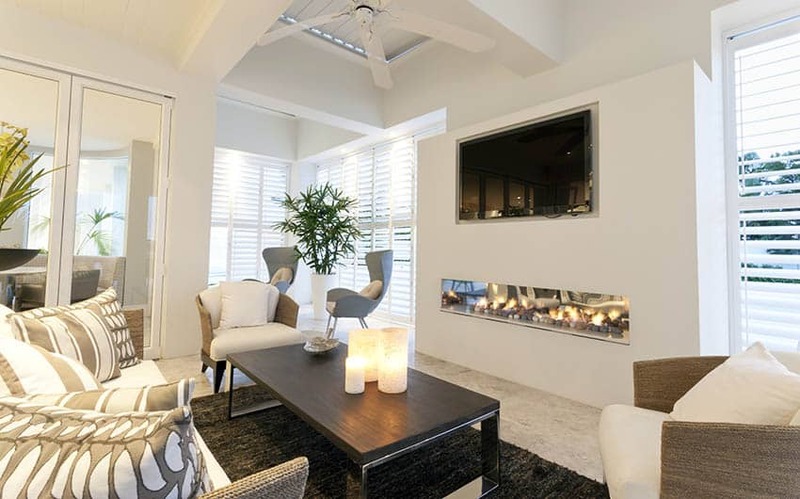 The addition of a minimalist fireplace also enhances the warm ambiance and gives it a more cozy feel. Cool tones also look good combined with an white living room design. This design in particular simply adds pale cornflower blue accent pillows to the all white slip-covered chairs. Warm white lighting adds a bit of warmth to the space, and the large windows depicting a moody scene enhances the cool and mysterious aura of the space.